For some children, there is an ultimate anxiety associated with reading aloud in class. Every syllable is a struggle, and every sentence is a skirmish. The spoken word slip ups make the child even more self-conscious when speaking in front of his or her peers. Insecurities take over as the student’s class participation dwindles from an unwillingness to risk embarrassment. Sadly, the aforesaid scenario is all too true for many children, but the recent partnership by PAWS for People and the Whitman Branch, 200 Snyder Ave., is set to lessen that reality for young South Philly readers. PAWs for People is a non-profit volunteer organization focusing on pet therapy with more than 400 enlisted teams working within a large assortment of programs. 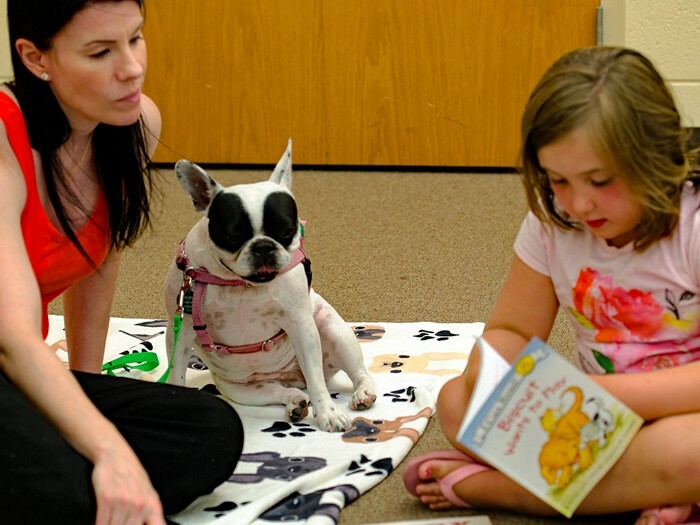 The group works with a variety of ages, but PAWS for Reading is prominently for children while being based at numerous mid-Atlantic libraries. 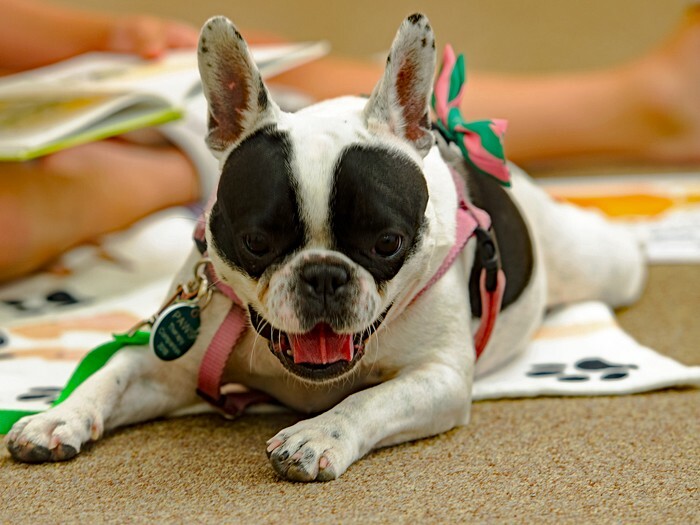 Since July 11, Bella the French Bulldog and human companion Tawny Clark have visited Whitman in association with PAWS twice a month to act as non-judgmental listeners for youngsters ages six to 12 as they read aloud. The books are specially chosen by Children’s Librarian Rachel Solomon with fiction tales that feature dogs or non-fiction stories about exceptional canines. Bella and Tawny were assigned to Whitman after a request through the PAWS website and following the completion of an on-site meeting. While there are many ways that Shaknovich could promote reading within young visitors, the Washington D.C. native felt it was best to use something close to her heart. “I’m a dog person. I have a dog, too, and I think dogs in general are great to help you to feel loved and happy,”she said. 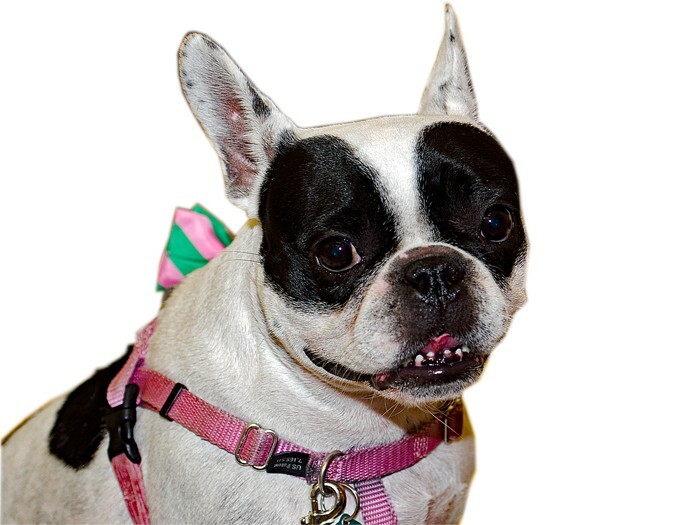 Although she had the idea to enroll the Whitman Branch in PAWS for Reading, the program would fail without the right dog, and Bella the French Bulldog is definitely that. Bella possess a calm nature that is welcoming to all and a friendly disposition that inspires confidence in apprehensive readers. She has gone through the training that PAWS mandates for its therapy dogs, although Bella had the personality to help people since she was a pup. Clark adopted Bella when she was eight-weeks-old, and it’s been a mutual love affair ever since. The pet’s temperament from a young age led her owner to believe that Bella would be a great therapy dog. “She’s a real people person. Because I live in the city, she is always meeting people on the street and being sociable. Because she brought me so much joy in my life and other peoples’ lives, I just thought she would do a great job as a therapy dog,” Clark said. Bella was an obvious choice for a therapy dog because she already helped to change her owner’s life. Clark is a former fitness competitor but decided to leave the lifestyle after being diagnosed with binge eating disorder shortly after her first competition and seeing first-hand the unhealthy eating habits that competing can cause. Since her retirement, the Upstate New York native has been very vocal about her struggles with the disorder to bring awareness to the topic. Though Clark faced her difficulties, Bella still remains a constant reminder of the good in her life. “She has brought me so much love and happiness, and another focus beyond myself. I knew she would have the ability to do the same for others,” Clark said regarding her relationship with her loving pet. With great people like Clark, Solomon, and Shaknovich and an exceptional dog like Bella present at Whitman, the PAWS for Reading program will be a long-standing success in South Philly. Shaknovich already has plans to expand the concept as she went on to say “We plan to continue to offer PAWS for Reading programming consistently throughout the year. Tawny and Bella will continue to come back two Mondays each month, and we are planning on adding a second dog and human therapy team to our schedule on Saturdays. Working with PAWS has been amazing, and we hope to partner with them for many years to come”.